Alexandre Andreyev, Mikhail Baskhanov and Tatyana Yusupo’s The Quest for Forbidden Lands is both a good read and beautifully illustrated…sadly it’s also very expensive so probably a library borrow.. 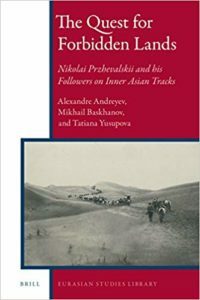 The Quest for Forbidden Lands: Nikolai Przhevalskii and his Followers on Inner Asian Tracks is a collection of biographical essays of outstanding Russian explorers of Inner Asia of the late nineteenth – early twentieth century, Nikolai Przhevalskii, Vsevolod Roborovskii, Mikhail Pevtsov, Petr Kozlov, Grigorii Grumm-Grzhimailo and Bronislav Grombchevskii, almost all senior army officers. Their expeditions were organized by the Imperial Russian Geographical Society with some assistance from the military department with a view of exploring and mapping the vast uncharted territories of Inner Asia, being the Western periphery of the Manchu-Chinese Empire. The journeys of these pioneers were a great success and gained world renown for their many discoveries and the valuable collections they brought from the region.